Stores are already bombarding our senses with signs of the December holidays, so it is refreshing for me to step back from that and introduce children to Thanksgiving. While teaching children about the history of Thanksgiving, as well as the spirit of the holiday, I also remind myself to take time to think about everything I have to be grateful for. One of the best ways to introduce children to Thanksgiving is through beautifully written and illustrated picture books. I have listed 10 books that I enjoy. Some are wonderful resources for teaching young children about the first Thanksgiving, while others highlight the importance of recognizing and being grateful for the wonderful people and things in our lives. 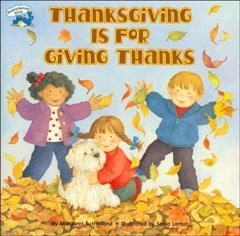 There are also a few books that incorporate the holiday season in an entertaining story. 1. Thanksgiving is for Giving Thanks by Margaret Sutherland - Beautifully illustrated and written, this book highlights the importance of being grateful for the wonderful people and things in our lives. 2. Thanks for Thanksgiving by Julie Markes - Appealing, detailed illustrations and simple text focus on the children in a loving family as they recognize all that they are thankful for. This book truly captures the spirit of Thanksgiving and even has a page at the end of the book to allow children to write down what they are thankful for. 3. T is for Turkey by Tanya Lee Stone - This delightfully illustrated book uses the alphabet as the structure for telling children about the first Thanksgiving. The rhyming text adds to the enjoyment of the book. 4. The Littlest Pilgrim by Brandi Dougherty - This sweet tale about a small girl will be easy for young children to relate to. The fact that the main character is a Pilgrim offers children a glimpse into the life of these early American settlers. 5. One Little, Two Little, Three Little Pilgrims by B. G. Hennessy - This adorable book, which can be sung to the familiar tune, is a great introduction to the first Thanksgiving feast. The book gives accurate information in an easy to understand way with young characters that will appeal to children. 6. The Night Before Thanksgiving by Natasha Wing - Modeled after the poem ‘Twas the Night before Christmas, this rhyming book tells the story of a family as they prepare for the Thanksgiving meal. The story also shows this family sharing their meal with extended family and saying a prayer at the table. 7. ‘Twas the Night Before Thanksgiving by Dav Pilkey - Another book set in the rhyming style of ‘Twas the Night Before Christmas, this adorable tale of eight children visiting a turkey farm will delight your little one. The author has a sense of humor as he names the farmer, for example, Mack Nuggett. This is an entertaining book, told with the turkey’s perspective in mind. 8. A Plump and Perky Turkey by Teresa Bateman - Rhyming text and playful pictures are fun for children. The turkey theme sets the stage for discussions about Thanksgiving. 9. The Thankful Book by Todd Parr - The bold, colorful, and easily recognizable illustrations by Todd Parr grab children’s attention. This book is a wonderful springboard for discussions with children about the many small things in the world to be grateful for. 10. Arthur’s Thanksgiving by Marc Brown - While not about the Pilgrim’s first thanksgiving or a family celebration, this is an entertaining story for fans of the Arthur series. Arthur is given the job of directing the class Thanksgiving play which poses quite a dilemma for this favorite storybook character. Happy Thanksgiving to everyone. I hope you are able to spend this special time with the special people in your life. Listening, Language and Winter Holiday Fun! Listen & Learn with: Thanksgiving Guess Who?